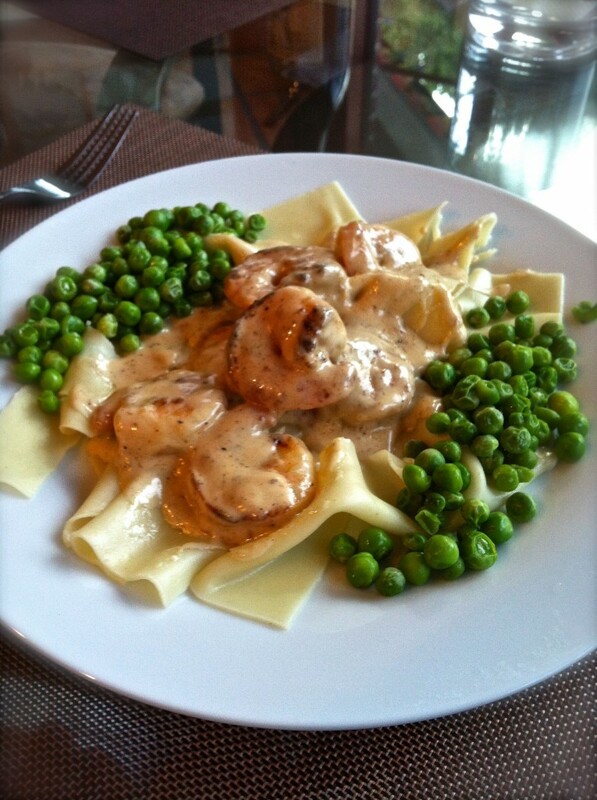 I feature Cognac Shrimp for three reasons. It is quintessentially French (butter, cream, wine, cognac) and I always like to include the French in my Texas-Mexican perspective. It’s a good choice for parties because you can prepare all of the elements ahead of time and be free to enjoy your guests. And finally, the creaminess-with-tang gives me a chance to talk about a topic I like, denaturing of proteins. A protein is denatured when it confronts a situation in which it can no longer hold together its natural molecular structure. For instance, when the proteins in milk interact with acid the milk curdles. Add any acid (lemon, wine, vinegar) to milk or light cream and they will curdle. Milk will curdle even when poured into a cup of very acidic coffee. But add acid to heavy, whipping cream and it won’t curdle. Why? Because the high fat content protects the milk protein from denaturing. It’s like a heavy coat keeping the milk protein protected from the effects of the acid. So as you make Cognac Shrimp, keep in mind your success in NOT denaturing the milk proteins and thereby creating a delicious sauce that contrasts: prominent brightness of the white wine in the midst of flavorful creaminess. 1. In a skillet, heat the butter on medium heat, then add the shrimp, 1/4 tsp salt, and cook, turning once or twice, until just cooked through, about 2 minutes. 3. In a saucepan, bring the wine and shallots to a boil and let simmer for about 10 to 15 minutes until the liquid is reduced to 1/4 cup. 4. Using a fine mesh sieve, pour the liquid into another saucepan, pushing down on the shallots to squeeze out their liquid. 5. Add the whipping cream to the wine liquid, stirring all the while with a wooden spoon or a heat-proof rubber spatula. 6. Place the saucepan on medium heat and bring to a simmer, stirring. Cook for about 5 minutes to reduce slightly. 9. When combined, add the shrimp, bring to a gentle simmer and heat through. Add salt and pepper. I recommend you serve it over wide noodles with green peas. McGee, H. (2004). On food and cooking: The science and lore of the kitchen. New York: Sribner. I think most stores will have it in the spice section, Arrowroot, that is. Let me know how it works out. So where do you get the arrowroot? I’ve don’t remember ever seeing it. Yes,I agree that it would work well to add just a dash of pernod to the shrimp. You can do this in addition to the cognac. A dash of Pernod does wonders for shrimp, lobster sauce. What a fabulous recipe! It has so many of my favourite things. but I am unfamiliar as to what Arrowroot is. We had Arrowroot biscuits when we were young children, but I have never heard the word used in any other context. Also wondering if you’ve made the recipe with Pernod rather than Cognac? I love the flavour of Pernod with shrimp and would like to substitute, as we never buy Cognac. Hi, Christina. It is really delicious. If you do make it, please let me know how it goes. have a nice day. This looks delicious! I’ve never made a beurre blanc sauce but after seeing this pic I definitely need to. Also good to know about an acid being added to the heavy cream – I always wondered why it didn’t curdle.